Have you ever dived into a video edit only to discover your handheld footage is a bit… too handheld for what you’re trying to do? You probably made the best of the situation when you were out filming without a gimbal or Steadicam, but now the footage just looks too shaky. You’re not making a Bourne movie here! Fortunately, using Adobe Premiere to stabilize footage is easier than you think. Previously, stabilizing footage in post-production was an After Effects question. But although After Effects gives you a lot more flexibility with the footage, if you need a quick solution, Premiere Pro CC includes a perfectly capable stabilizer tool to smooth out any camera shakiness and improve your footage. Let’s break down exactly how to stabilize video in Premiere Pro using Warp Stabilizer. Applying the Warp Stabilizer effect is a breeze. After you’ve booted up Premiere Pro, you can stabilize footage using the Warp Stabilizer the same way you’d apply any other effect in Premiere. 1. Select the clip you want to stabilize. 2. Head to the Adobe Premiere Pro Effects panel and find Warp Stabilizer. 3. Double click or drag it onto the clip on the timeline. 4. You should see a blue Analyzing message across the footage. Leave it for a minute or two to do its thing. The time this takes depends on the length and complexity of the clip. You can keep editing while this happens in the background. 5. Adjust the Smoothness parameter to tweak the overall amount of stabilization. You might not need to change this very much to get the result you need. 0 is closer to the original camera footage; higher values create a much more visible effect. 6. If you want to create the effect of a stationary camera with no movement whatsoever, select Stabilization > Result > No Motion. If you just want to remove the shakiness but keep the camera movement, select Smooth Motion. 7. Click Analyze again to see the results. How’s it looking? You might be happy to leave it there. Or you might see some warping in the background that doesn’t look too great. Dig further into the guide to find out how to mitigate this. Remember: Any time you make a change after initially applying the effect, you’ll need to click Analyze again to see the results. This goes for changes to the clip as well, so bear that in mind if you trim it later on. 8. Hopefully, your clip has now gone from shaky to stabilized! How Does Warp Stabilizer Effect Work? So, now you know how to edit using the Warp Stabilizer, but to make the most out of it in Premiere Pro, it’s worth understanding how it works. 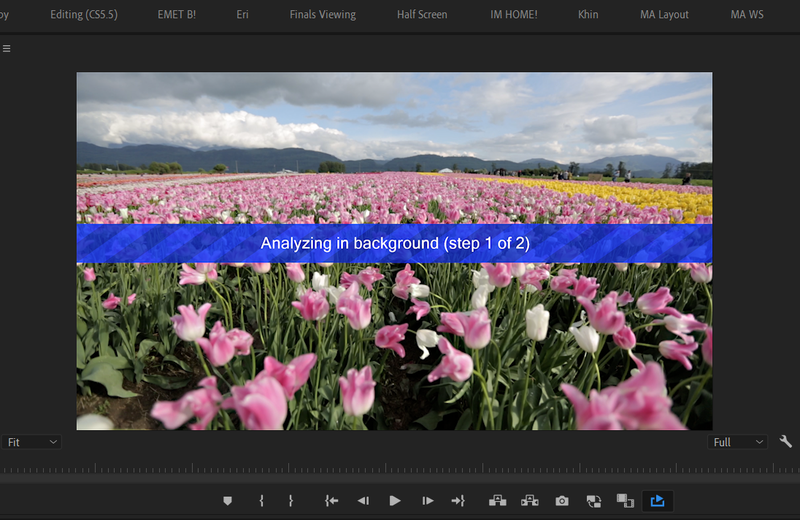 Basically, Premiere analyzes the footage frame by frame, moving the pixels within each frame to make the camera appear steady. This is super useful to smooth out shaky shots, but it’s by no means perfect. If you’ve followed the steps to stabilize your footage, take a moment to familiarize yourself with the different options and if you’re not happy with the default results. Then, tweak some of the sliders before heading to the Advanced options (we’ll cover this a bit more below). Premiere Pro’s stabilize function is a powerful tool, but it has its limitations. The steadiness of a clip might be offset by some noticeable warping in the background. You’ll know it when you see it. Tweak the Smoothness slider to reduce this effect until you have something you’re happy with. Alternatively, try switching the Method to Position, Scale, Rotation, or Subspace Warp. Still no luck? Jump into the Advanced drop-down and check Detailed Analysis. You can find more on that below. Warp Stabilizer is a bit of a balancing act. There might have to be some compromise between the smoothness of a shot and losing some parts of the frame. Remember the effect isn’t precious about cropping the shot, only about creating stable footage. So it might crop out the edges more than you would like, in order to get a clean, smooth shot. You can mitigate this by tweaking the Crop Less <-> Smooth More slider in the Advanced settings. Shooting with a faster shutter speed, if possible. This will give you lots more flexibility when applying the effect in the edit. Is something not quite right? Maybe you’ve lost some stabilization after doing a quick color fix. Make sure you’re not changing the source for Warp Stabilizer analysis. Check the order of effects in the Effect Controls panel. The effects on the top are applied first, so Warp Stabilizer should always be at the top. If you switch anything around, remember to re-analyze the clip. Once you’ve found a combination of settings that gives you a result you’re happy with, you can save it as a preset. This should speed up your workflow nicely when you are working with a lot of shaky footage or if you want to create a similar effect across multiple projects. Remember that Warp Stabilizer needs to analyze the individual clip frame by frame — it’s not a ‘one size fits all’ model. So just hit that Analyze button even after you’ve applied the preset to turn it on. Once you’ve got the hang of the default Warp Stabilizer effect and what happens when you tweak the sliders, take a look at the settings in the Advanced tab. Detailed Analysis is a simple checkbox that will make the algorithm work harder to find parts of the footage to track. You might end up with a smoother shot, but you’ll also have a much heavier, slower project — so there’s a trade-off. Are you finding the odd rippled distortion in your footage? Generally, the stabilizer should automatically remove this, but If it was shot with a rolling shutter camera, try setting Rolling Shutter Ripple to Enhanced Reduction. Our personal favorite is the option to hide that pesky warning banner that tells you to re-analyze the footage — even when you don’t want to! Remember the warning banner shows up on the exported file so this is also a handy way to avoid any embarrassing client conversations. One of the most common error messages we see is a red banner across the footage when you try to change the speed on a stabilized clip. It’s pretty self-explanatory: you can’t use Warp Stabilizer and change the speed of the same clip. There’s an easy fix. Right-click the altered clip, then click Nest. You can then stabilize the nested sequence without any issues. Thanks to Warp Stabilizer, using Adobe Premiere to stabilize video is quick, and with a bit of practice easy to get to grips with. But much like most post-production fixes nothing beats getting things right on the shoot. Plan ahead, shoot with this feature in mind if you intend to, or find yourself a gimbal to smooth out the shots in-camera. But if you’re still unhappy with your shaky footage, Warp Stabilizer will do the best it can to fix it up. Copyright © 2013 - 2019 Motion Array. All Rights Reserved.